That moment when the September Issue arrives in your mailbox. That moment each August, midway through August, when there is just enough time to get through those 902 pages (as is for the year 2013) before fashion week arrives in September. That moment when there is still enough time to enjoy summer before the cold of winter. That moment when all else seems to disappear as you begin to leaf through those glossy pages. All 902 pages. That moment is worth all 365 days of other moments. Oh what would we do without our September issue. 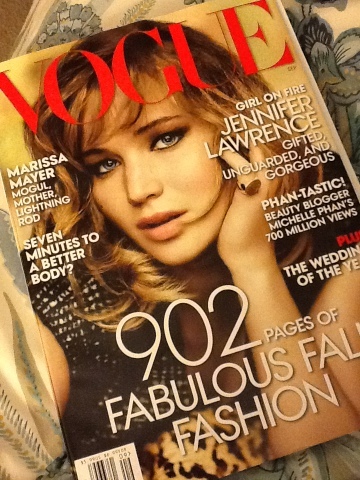 Our September Vogue.